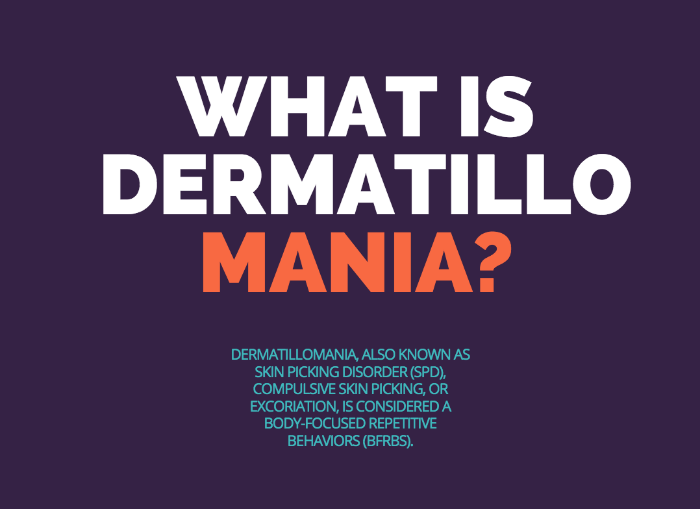 Dermatillomania, also known as skin picking disorder (SPD), compulsive skin picking, or excoriation, is considered a Body-Focused Repetitive Behaviors (BFRBs). Dermatillomania is commonly thought of the be part of the OCD spectrum, but it is important to note that it is not classified as such is the DSM-5 (about 23% of people diagnosed with OCD also have dermatillomania, so while it is not considered an obsessive-compulsive behavior, many people are diagnosed with both). People with SPD repetitively touch, rub, scratch, pick at, or dig into their skin to the extent that this behavior causes physical damage. Not all people who pick their skin have SPD. This disorder is not to be confused with trichotillomania, which is the repetitive pulling out of one’s own hair (another note: repetitive picking at one’s scalp would be considered dermatillomania, not trichotillomania). The picking is often to try and remove small “imperfections” and irregularities. Many people who have SPD have a pre-existing dermatological condition (for example, cystic acne or eczema), but this is not a requirement to be diagnosed with dermatillomania. It is said that SPD may affect as many as 1 in 20 people and occurs more frequently in women; the starting age of this disorder varies greatly, but commonly begins during/slightly after puberty. Common places to pick include the face, arms, legs, back, shoulders, and stomach (basically everywhere). Most people have a primary area that they pick at first, but will move on from that area to allow it to heal. Picking can include the person’s fingernail, tweezers, pins, etc. A common treatment for dermatillomania is CBT (cognitive behavioral therapy). If you have a deep wound (something that might need stitches) or think you have an infection, please seek medical treatment, or reach out to us to discuss how to best help the situation. BFRBs are not considered self-harm because the intent of the behavior is not to harm oneself, but rather to fix, correct or otherwise make better some aspect of physical appearance (for example, get rid of a blemish, or a hair that doesn’t seem to belong). BFRBs are also a coping mechanism for overwhelming emotions, but once again the intent is not to cause damage. When it comes to BFRBs, the physical damage done is just a by-product of the behavior.